Barack Obama has suggested the Dakota Access pipeline could be rerouted around sacred Native American lands in comments that are the president’s first on the controversial oil project since police arrested hundreds of indigenous protesters during violent clashes. After months of pleas from activists in North Dakota to stop construction of a pipeline that the Standing Rock tribe says could contaminate its water supply and threaten its cultural heritage, Obama said in an interview released on Tuesday night that the government was “going to let it play out for several more weeks and determine whether or not this can be resolved in a way that I think is properly attentive to the traditions of the first Americans”. 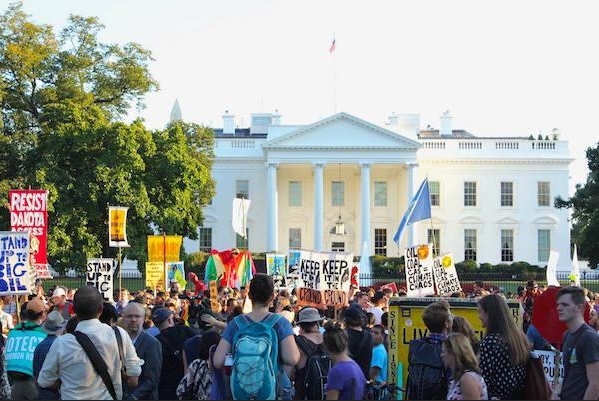 Obama had been silent since the army corp’s announcement, and Energy Transfer Partners, the company operating the pipeline, has rapidly moved forward with construction, in recent days approaching the massive protest camps and river where Native American leaders fear significant damage. Responses to "President Obama finally speaks on Dakota Access Pipeline"